We are just back from our annual camping trip to the mountains where there is no cell phone reception and no wi-fi. What we do have is a cozy trailer where we sleep better than we do at home since there are no chores waiting for us when we wake up. I enjoy baking in that little kitchen and find that blessing our camping neighbors with treats from my trailer oven is both fun and a great way to make new friends. I made these breakfast rolls and shared them with a couple from Germany who was on their honeymoon and touring beautiful British Columbia in a rented motorhome. Whether you bake these at home for special breakfast or in an RV, they will be welcomed by your neighbors where ever you live. Stir together the flour, salt, sugar and baking powder and cut in shortening with a pastry blender. Beat the egg in a small bowl and add the whipping cream and then stir both together into the flour mixture. Stir until combined. 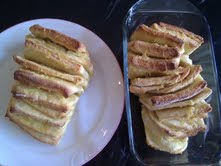 Roll into a rectangle and spread with melted butter, sprinkle with brown sugar and cinnamon and then the shredded apple. While still warm, ice the rolls with a with a simple icing made by mixing together icing sugar and whipping cream until it is a spreadable consistency. Serve warm. There is a contest winner to announce today as well! Did you enter the contest that we had posted on our sidebar? Our publicist Graf-Martin Communications hosted a contest in honor of our new cookbook Celebrations. Mimi from Markham Ontario entered the contest and made Betty's Layered Lemon Loaf. Her entry was chosen and she has been sent her gift pack. If you haven't ordered your cookbook yet..
Oh Lovella, these apple cinnamon rolls look delicous..I want to camp next to you! And congratulations to Mimi, the contest winner! Thank you, Betty. This loaf's is not just AMAZING, it tastes delicious too. My photos are not very good, they didn't show the whole pictures. Next time, I'd like to try aromatic cinnamon one. Thanks for the recipe. ohhhh they remind me of my mom's and since there is no yeast and rising involved (which i don;t do) i am definitely going to try these. and that is the very book by my coffee every morning-terrific encouragement from His Word every day isn;t it. ! Does this cinnamon roll recipe really have no sugar in the dough? Now that you mention it...I did put in a couple of tablespoons but really it wouldn't be necessary. The sweetness of the filling would be sufficient. I added in the sugar now..thanks. Oh those sure do look delicious - I'm like Betty - would love to be your neighbour camper for sure! Congrats to Mimi! After seeing these yesterday, I just had to try them. I used 2% milk instead of cream. I had to use more flour, because of the amount of liquid. Not sure what I did differently. I also made them small, almost bite size. My family thought they were yummy since there are only 5 left today. I've tried quick cinnamon buns before, & these are softer, which I'm thinking is because of the crisco I put in & not butter. I also tried it before the sugar was added above. Didn't notice a difference at all, since you are sprinkling sugar on top anyway. These are a great quick cinnamon bun. I don't see the amount for the shredded apple. Am I just missing it or is it not there and you just put a layer? Please help me!! I just made these, but with butter instead of shortening and evaporated milk in the place of cream, both of which I always use as a substitute. I had to add lots of extra flour to be able to handle the dough. What did I do wrong? I don't see my comment, so not sure if I did something wrong. 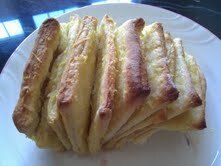 I made these this afternoon and had to put lots more flour into the dough. I used butter as I don't use shortening, but I always do that in recipes that call for shortening. They are too "floury". Can you give me any hints? The two differences of shortening to butter and evaporated milk to heavy cream can make a significant difference in the feel of the dough. I would have likely just been generous in using flour when I rolled them out. Other than that, I am not sure how to help you. I haven't tested the recipe with butter and evaporated milk. I'm sorry they didn't turn out for you. Thanks for replying to my message. Guess I'll not be able to use this recipe since I never use trans fats in cooking. I loved these. They were a great quick addition to my brunch this morning. I used buttermilk instead of cream. The recipe made 15 "rolls". I would for sure make these again! Thanks so much Lorrie! I sure appreciate knowing they turned out for you.